Product prices and availability are accurate as of 2019-04-19 05:33:28 UTC and are subject to change. Any price and availability information displayed on http://www.amazon.com/ at the time of purchase will apply to the purchase of this product. 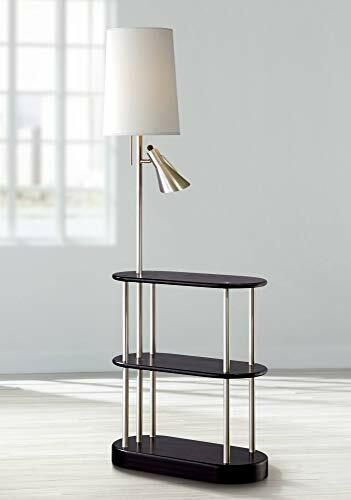 Create space, add style and bring bright light to your room with this triple shelf floor lamp. As an added bonus, this floor lamp also features a side reading lamp with its own on/off switch. Three espresso finish shelves give you space for magazines, collectibles and more. An off-white linen shade and brushed nickel finish on the metal base completes this contemporary design. Overall: 66" high. Shelves are 26" wide x 12" deep. Shade is 10" across the top x 12" across the bottom x 16" on the slant. Shelves are 16" and 29" high from floor. Takes one 150 watt medium base bulb and one 40 watt medium base bulb (not included). On/off pull chain for main bulb and on/off rotary switch on reader head. Espresso finish, brushed steel finish metal frame, off-white linen shade. Use as an end table, office accent, or reading lamp.